Plot Summary: Determined to stay close to the girls who raised her when she lived in the Human World, Hana-chan bursts her magic crystals to perform an extremely powerful spell that makes her look as old as her adoptive mothers. The loss of her magic crystals means that she is not officially a witch anymore. 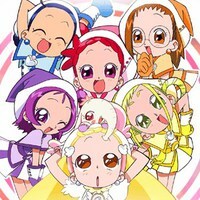 To handle this enormous problem, the Witch Queen asks Doremi, Hazuki, Aiko, Onpu, and Momoko to take care of the new older-looking Hana-chan in their world for the moment. In the meantime, the little former sorceress will have to complete the witch apprentice exams in order to attain a magic crystal and hopefully become a witch once again.